Wholegrain wheat is an important grain, containing a large amount of carbohydrate, most of which is starch. Wheat also contains gluten, providing protein and giving that elasticity and structure necessary for bread baking. China produces the most wheat worldwide, followed by India, US and Russia. Wholegrain wheat is a good source of the minerals iron, manganese, phosphorus, magnesium, potassium, and zinc. From vitamins it provides B6, folate, thiamin, riboflavin and niacin. Iron and B-vitamin deficiencies have become prolific since the processing and refining of whole wheat into various grades of white flour has become common practice. 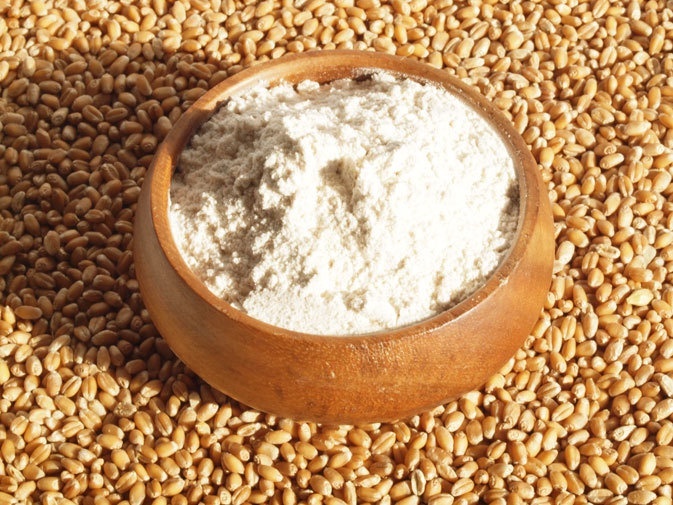 The whole, unrefined, unprocessed wheat grain is a valuable and nutritious article of diet. White flour products on the other hand are heavily depleted as most of the vitamins and minerals are contained in the bran and the germ, which are removed when wholegrain wheat is turned into white flour. The wheat we use is grown by organic famers in Marton, about 45 minutes from Kimbolton (near Wanganui). We buy several tonnes of wheat grain at a time, to ensure the year's supply, and keep consistency in our products. When kept in a dark, cool, rodent-safe environment whole wheat stores well. We grind our wheat flour on a daily basis in our zentrofan stone-mill. This produces a very fine textured flour, whilst retaining the full grain. If you are switching from refined flour to wholegrain wheat, increase your cooking times. Bread will be denser and more chewy, also darker in colour. It is easy to substitute whole wheat in biscuit, cracker and pastry recipes. Like all changes, it takes time and experimentation to perfect recipes with 100% wholegrain wheat. One great way to use wheat (or spelt or kamut), other than bread, is what we call 'Bible bread.' It is an unleavened flat-bread. Simply add seven parts (by weight) whole wheat flour to a bowl with one part ground nuts or seeds, one part good oil, four parts water and a little salt (1 tsp salt to 500g grain is a good rule of thumb). Knead the dough for a few minutes, form balls and roll-out like pita bread. Bake at 165 deg C for around 30 mins until golden on the both the top and bottom and crunchy. Delicious as a bread replacement with spreads, soups etc, or just as they are for lunch boxes or travelling. Some of our breads and our sesame wheat crackers use wholegrain wheat.